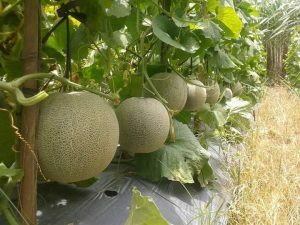 Tanaman Melon Sehat Tanpa Karat Daun, photo by: Wahid Priyono (dalam http://guruilmuan.blogspot.co.id). Penyakit karat daun telah banyak menimpa dari tanaman-tanaman tropik seperti pada kopi robusta dan kopi arabika biasanya sering menjadi sasaran empuk. Pada tanaman seledri, kacang tanah, dan jagung yang tidak mendapatkan perawatan yang baik juga memungkinkan terserangnya tanaman dari penyakit karat daun ini. How to Manage the Leaf Rust? The leaf rust is one of the known diseases that can attack horticultural plants. This disease causes damage to certain organs, especially leaves. Leaf rust usually happens to tropical plants like coffee, celery, peanuts, and corns. Varieties of coffee that are often attacked by leaf rust are Arabica and Robusta coffee. However, based on the immune system, Arabica coffee variety is more vulnerable to leaf rust than Robusta. The way to prevent leaf rust on both varieties so far is by spraying fungicides on them. In East Java, Indonesia, several varieties of coffee like the S795, USDA, and Karika are vulnerable to leaf rust. However, lately, Karika coffee type is even more vulnerable to the attack. Some fungicides that coffee farmers usually use to take care of leaf rust are systemic fungicides like tramadefon (Bayleton 250 EC) or copper fungicides like copper Sandoz, cobox, cupravit, and vitigran blue. Especially for corn, the sign of leaf rust can be seen through yellowish white dusting on the underside of the leaf or in between stem segments. To prevent leaf rust on corn, it’s best to buy seeds that can tolerate and withstand diseases. They’re usually labeled so in your local shops or you can ask the seller directly. If needed, you can use fungicides like copper oxychloride, zineb, fermat, and dithane. Peanut plants are often made to be host plants for parasitical fungus that causes leaf rust. You can prevent this by implementing the technical culture system which is making sure you have enough row spacing distance between one peanut plant and another to avoid high air humidity. Control can also be chemically done using fungicides like fermat, zineb, copper oxychloride, and dithane. The sign of leaf rust on celery is the cluster of fungus that causes leaf rust that’s dusty and yellowish white in color. The type of fungus is the Hemileia vastatrix. This will cause celery leaves to curl. Prevention can be done by growing celery using hydroponic system. Early, scheduled watering is also good to help prevent leaf rust.